Will you be in the Milwaukee (1 and 1/2 hours from Chicago) this weekend? Boutique Larrieux (who is also apart of our $1000 Shopping Spree giveaway) is partnering up with MonifC to bring you Ladies night. You can shop the entire MonifC Collection this weekend, Saturday April 16, 11am - 4pm . I am personally in love with this season's swimsuits! There will also Minx nails, eyebrow threading, and massages. I can hear the pampering calling...LOL. All this takes place at Boutique Larrieux, 717 N. Milwaukee St, WI 53202. 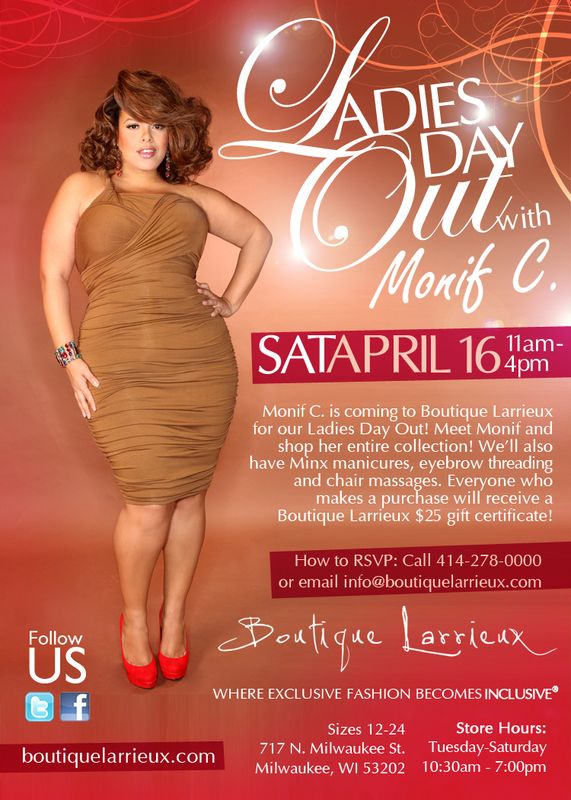 Call to reserve your spot at 414-278-0000 or info@boutiquelarrieux.com. Not in this area, shop Boutique Larrieux online. This plus size boutique has a great selection of plus size designers that you can't find in the department stores. I personally find these options to be the most stylish ones. I picked up quite a few things from her mega sale around Christmas. Enjoy! i know its sort of random..but i love that girls hairstyle!! !